Almost 1000 people reached out to Lives Lived Well for drug or alcohol support in the Darling Downs and South Burnett regions over the past year, a 50 per cent increase on the year prior. 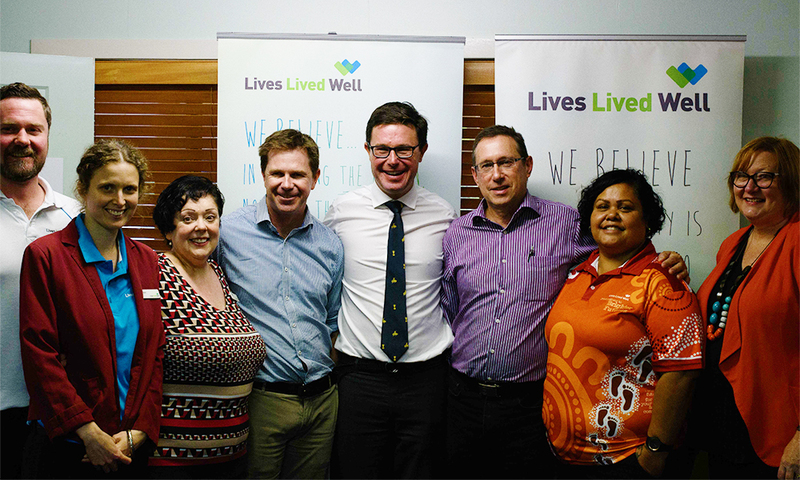 Lives Lived Well’s Clinical Services Manager for Southwest Queensland, James Curtain said the increase was partly due to the expansion of Lives Lived Well’s regional services, which had enabled more people to be supported. Mr Curtain was speaking at the opening of its relocated service for Lives Lived Well Kingaroy – a larger space at 95 Youngman Street. Also speaking at the opening was Federal Member for Maranoa, David Littleproud. Mr Littleproud said: “Last year I held a community ice forum in Kingaroy and it was clear more support was needed to help tackle ice and addiction – that’s why I secured Federal Government funding for an additional clinical worker for a better targeted approach in the Kingaroy region. “This is an important service offered by Lives Lived Well that not only can save lives but also supports families. Speaking about the service, State Member for Nanango Deb Frecklington said: “Lives Lived Well offer an essential service here in the South Burnett and I’d like to thank the Federal Member for Maranoa, David Littleproud for his advocacy in ensuring ongoing funding for these important programs. Mr Curtain thanked both State and Federal governments for their ongoing funding support of the various programs as well as the Darling Downs and West Moreton PHN for their support, under the Australian Government’s PHN Program. Darling Downs and West Moreton PHN CEO Merrilyn Strohfeldt said mental health and alcohol and other drugs continue to be priority areas for the PHN with the region having the highest percentage nationally of clients self-reporting current anxiety and the fourth highest self-reporting current depression. “Lives Lived Well offer invaluable services to people living in our communities needing mental health and/or alcohol and other drugs support and this new space will ensure more people can be supported,” she said. Lives Lived Well is a not-for-profit drug and alcohol support service which offers free counselling and support in Kingaroy, Cherbourg, Toowoomba, Chinchilla, Warwick, Gatton, Tara and Dalby as well as free outreach services to surrounding areas. cannabis remained the primary drug of concern for most people seeking help at Lives Lived Well Darling Downs. Mr Curtain said the increase in people seeking help for methamphetamines was a trend seen by other Lives Lived Well services across Queensland. He said Lives Lived Well was receiving strong demand for the free mental health program NewAccess, which was launched in August 2018 and is delivered in Gatton, Warwick, Kingaroy and Dalby. Positive Pathways is also a new program, which started six months ago. People experiencing problems with drugs or alcohol or who have mental health concerns, can call Lives Lived Well on 1300 727 957.